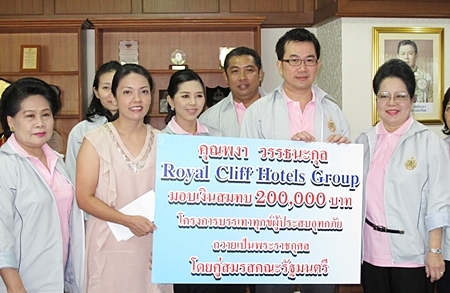 The Royal Cliff Hotels Group joined hands with other sectors and extended its sincere empathy to those affected by the current flood situation in the Kingdom, with the hope for the situation to ease and recover with the efforts that have been thoroughly undertaken by the government, private sectors and individuals. As part of the Royal Cliff’s continuous Corporate Social Responsibility measures and commitment to the well-being of the affected community, the property was honoured to lend its hand by contributions in cash and kind with a genuine hope that these contributions will make the lives of those affected a little more comfortable. Royal Cliff’s representatives made these donations at the various Flood Relief centers, namely the Father Ray Foundation in Pattaya City, Wat Yansangwararam, in Sattahip and in Bangkok.